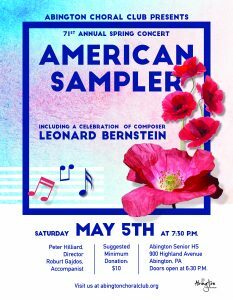 Abington Choral Club is thrilled to present American Sampler on Saturday, May 5th at 7:30 PM. This concert will delight and entertain with a rich selection of choral pieces that represent a broad spectrum of Americana. The concert will feature several rhythmic and moving spiritual pieces as well as a variety of music by Leonard Bernstein, in celebration of his 100th birthday. Join us! Sing along with us! Bring friends and family, children and grandchildren. All are sure to to enjoy this entertaining evening!